Santiam Valley Ranch nestles between the towns of Turner to the north, Stayton to the east and Jefferson to the southwest. Its 150 acres are located in the Mill Creek watershed in Marion County. We found home here in 1980. Since that time, use of the landscape has varied including waterfowl hunting on 19 ponds which were constructed in the 1940's, raising warm-water fish for pond stocking, production of lambs and wool, maintaining pasture, and the production of crops including grass hay, annual ryegrass, barley, sweet corn and bush beans. Prior to our ownership, the fields once held a herd of buffalo and old timers still recall this place "as the old buffalo farm." Since 2010, efforts have been made to produce renewable energy using a wind turbine and four photovoltaic systems. In 2012, approximately 100 acres were enrolled in the Wetland Reserve Program, administered by U.S.D.A. Natural Resource Conservation Service. This land is currently being restored to wetland and upland prairie through a permanent conservation easement. During this same time, approximately 18 acres were transitioned to certified organic crop-ground through the three-year phase in period. Since then, this land has produced organically certified sweet corn, bush beans and other organic crops. Dating back to the '40's and prior to land-use requirements in the '70's, the farm maintained two living structures -- one for waterfowl hunters and the other for farm management. 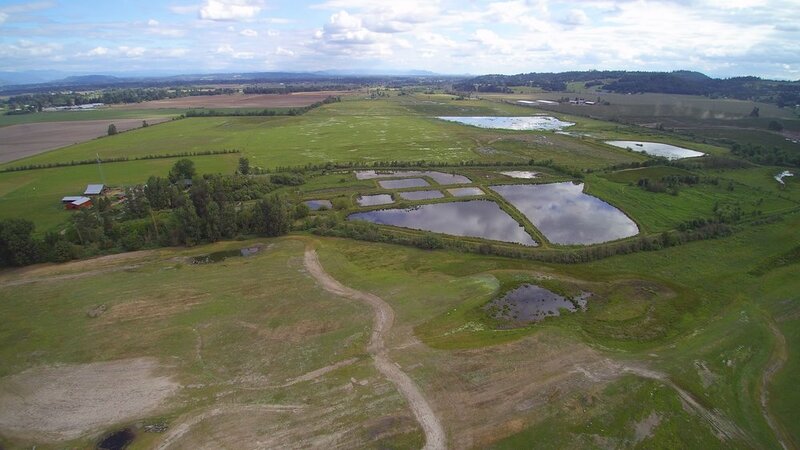 The availability of having two homes on the farm has offered us an unique option to expand into agritourism by creating Santiam Valley Farm Retreat--a gem providing a place for solace and quiet introspection while also providing an option for education about wetlands, birding, aquaculture, organic farming and energy production. Header Caption: One of many ponds located at Santiam Valley Ranch. This pond is used for waterfowl hunting during the winter and aquaculture production during the summer. The berms around the ponds are used for sheep pasture during the summer. Copyright (C) 2018, Santiam Valley Ranch, LLC. All Rights Reserved.